Fields of giant boulders threatened to destroy the Phoenix Mars lander on touchdown until THEMIS found landing sites that were relatively boulder-free. When NASA's Phoenix Mars spacecraft hurtled into the Red Planet's atmosphere in May 2008, it was heading straight for the unknown. Taking aim at a part of Mars where no spacecraft had successfully landed, Phoenix mission controllers set the non-roving lander down on the northern plains near latitude 68° north and longitude 233° east. Mars' northern plains, as big in area as the Arctic Ocean on Earth, surround the polar cap in a rough circle. They are smooth, low in elevation, and appear to have water (in the form of ice) only a few inches or centimeters below the surface. The Phoenix mission targeted that ice. The spacecraft was designed to scoop a sample of icy soil and analyze its qualities as a possible habitat for microbial life. Scientists chose a northern landing site because it offered the best combination of scientific value and engineering feasibility. Two instruments on NASA's Mars Odyssey orbiter pointed to the area: the Gamma Ray and Neutron Spectrometer and the Thermal Emission Imaging System (THEMIS). Data from the neutron spectrometer showed the ground at high latitudes on Mars is chockfull of hydrogen. Knowing that water is the commonest likely source for hydrogen, scientists calculated that water (as ice) should saturate the ground at very shallow depths everywhere across the northern plains. At the same time, flight engineers, noting the smooth terrain in the region, gave a sigh of relief. Phoenix needed a spot to land free of rocks taller than about half a meter (20 inches) and because the spacecraft couldn't move once it touched down, the site had to have at most only a few rocks covering the soil. This is where THEMIS stepped forward. "For Phoenix mission engineers, the issue of concern was rocks and boulders at the landing site," notes Philip Christensen, director of Arizona State University's Mars Space Flight Facility and THEMIS' designer. "If the Phoenix lander came down on top of a boulder, it would likely tip over, and the mission would end before it really got started." While THEMIS' heat-seeking infrared eye cannot spot individual rocks and boulders, it can distinguish areas that are relatively boulder-free from those with many of them. THEMIS does this by detecting warmth from the ground — the warmer the ground, the more rocks Phoenix would likely encounter and the riskier the site. THEMIS' partner in choosing a specific landing site was the HiRISE instrument, which is on NASA's Mars Reconnaissance Orbiter. HiRISE is a powerful camera that can spot large rocks and boulders on the surface, but it captures only a small field of view in each image. 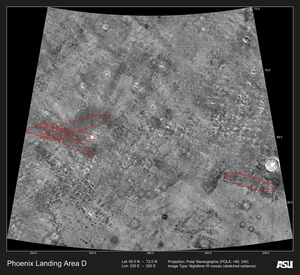 This made it impossible, for example, for HiRISE to photograph every possible landing site for Phoenix, given the time remaining before mission controllers needed to commit to a specific site. "When the first HiRISE images [of potential landing sites] came back with lots of boulders," recalls Christensen, "we began examining closely the night infrared images from THEMIS." These showed temperatures varying by several degrees, he notes. "But it wasn't always clear that the hotspots were hazardous. Something showing as warm could mean the surface was covered largely with sand or gravel — or about 40 percent by rock." In theory, thought geologists, sand and gravel were more likely than rocks in this area. "But HiRISE images showed the hotspots had abundant large rocks," Christensen says. "So I immediately made the assumption that all the thermal differences in the image were due to varying percentages of rocks." Christensen notes that other things besides rocks can raise the temperature — gravel and coarse sand for example. But the important thing for Phoenix, he says, was that "THEMIS always overestimates the risk." "THEMIS gives us the big picture," says Christensen. "This area is safe, this one isn't." Physics also works to our benefit, he notes. "There's lots of ways to make soil warmer and more dangerous. But you can't hide hot rock from THEMIS." Work published in the scientific journal Nature (May 3, 2007) echoes this finding and extends it more generally. Joshua Bandfield, a research specialist at the Mars Space Flight Facility, used THEMIS infrared images to study how areas warm and cool as Martian seasons pass. The results indicate how deep the ice lies. Areas with many rocks at the surface, Bandfield explains, "pump a lot of heat into the ground and increase the depth where you'll find stable ice." In contrast, he says, dusty areas tend to insulate the ice, allowing it to survive closer to the surface. "These two surface materials — rock and dust — vary widely across the ground, giving underground ice a patchy distribution." Computer models helped him interpret the temperature observations, he says. "They show areas where water ice would be only an inch or so under the soil, while in other areas ice could lie many feet below the surface." Says Bandfield, "The message for Phoenix was that THEMIS shows a lot of patchiness in the ground ice, and this should continue down to smaller and smaller scales." In the end, choosing the right site for the Phoenix Mars lander needed two key instruments. 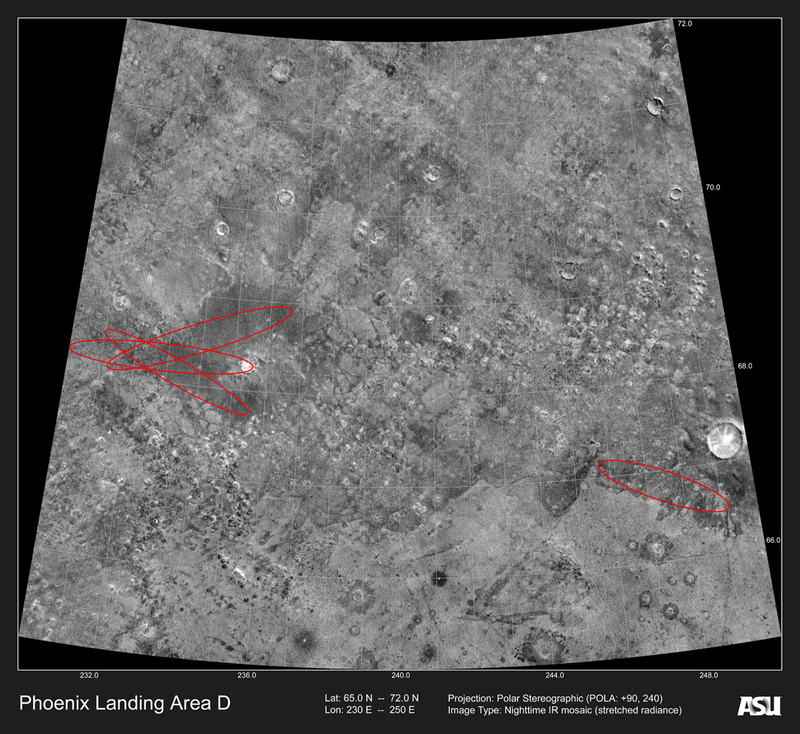 Says Christensen, "THEMIS found the landing site for Phoenix, and HiRISE validated it." Red ovals mark Phoenix landing sites around 240 degrees east longitude and 68 degrees north latitude. The chosen site lay near the clustered ovals at left. The scene is a mosaic of THEMIS night infrared images, with lighter shades of gray indicating warmer and rockier ground. The smallest features visible in the original image are 100 meters (330 feet) wide. Click on the image to download a 1MB version.